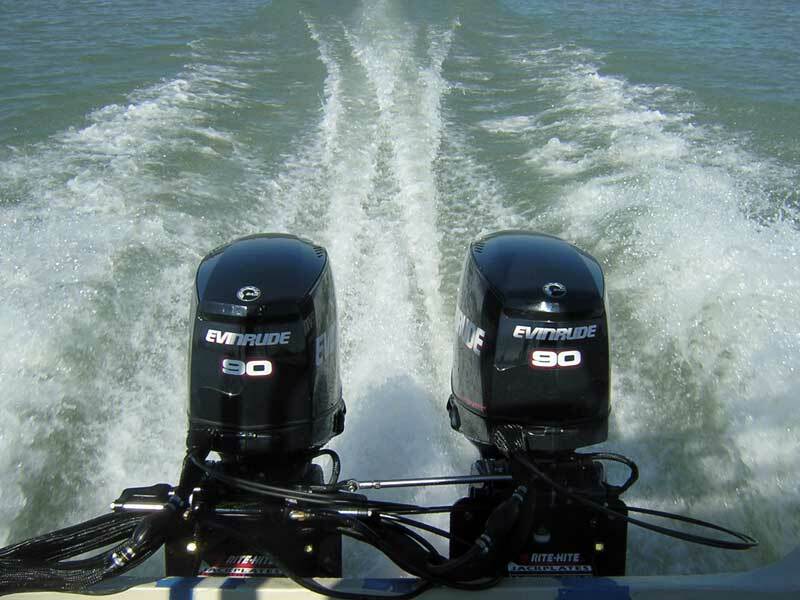 just fitted with twin 90-HP motors. Several years ago, Dave Buckalew purchased an Outrage 18 from a Texan who was a semi-professional fisherman, who had won the boat in a fishing tournament sponsored by Gambler fishing lures. They had adorned the boat with a large logotype of their company name. After a bit of negotiations, the new owner agreed to preserve the GAMBLER LURES graphics as an advertisement, and that's how it looked when Dave took delivery. When the boat arrived at its first northern rendezvous with our GLBWCC fleet, everyone liked the big name on the hull sides. 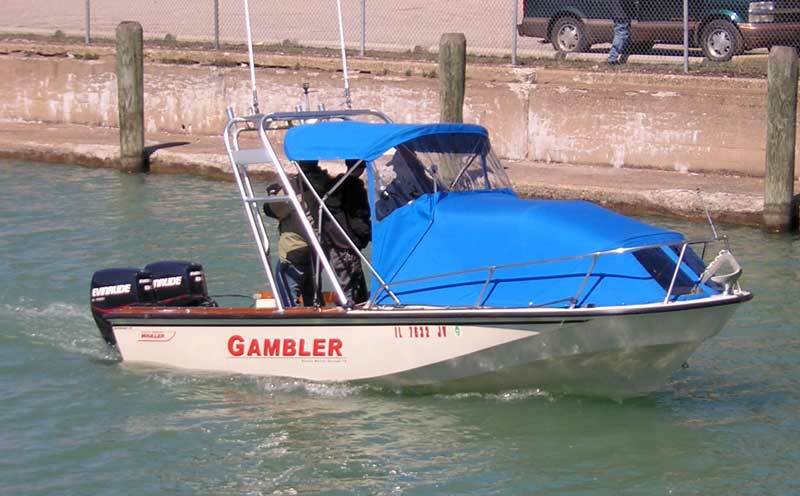 Dave decided to keep it, and the boat has been GAMBLER ever since. But, from that point on, just about everything else about the boat has changed. One of the first modification was the addition of a full set of Mills weather protection--definitely needed on a northern Great Lakes Whaler. Then a radar arch was installed. Finally this winter, a major overhaul was planned: the boat would be converted to twin engines. Dave had plans to use the boat in many remote areas, and the safety factor of twin engines was needed. 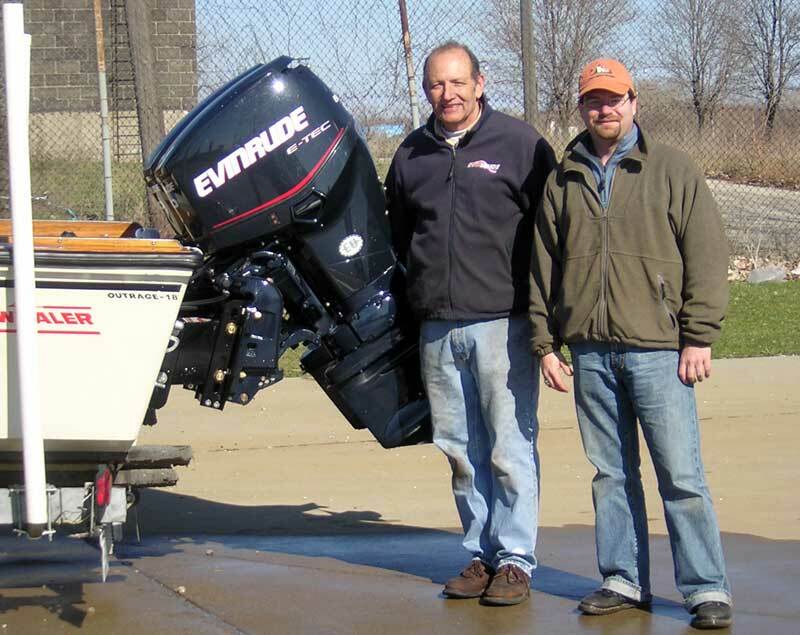 After looking at available engines, Dave settled on the Evinrude 90-HP E-TEC. The engine's size and weight were an excellent fit for the project. Once the E-TEC decision was made, the next step was to find a dealer who would cooperate with Dave's wish to participate in the rigging and installation process. 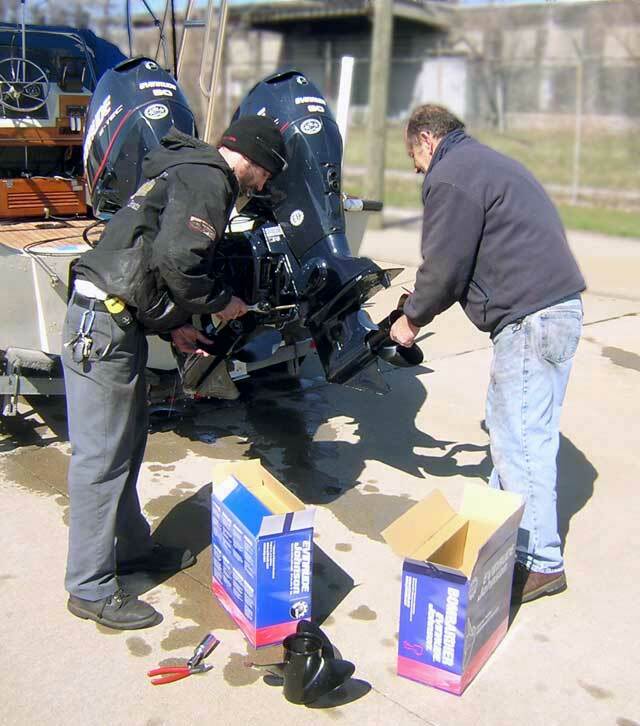 Dave settled on Lockeman's Boat and Hardware in Detroit, where owner David Zammitt was willing to supervise the installation, but let Dave Buckalew do a significant part of the work himself. The two Dave's worked out a deal, and the engines were ordered. In additional, Lockeman's also supplied new hydraulic steering, new top-mounting dual controls, new cables, new instruments, and rigging accessories. Somewhere in the re-power process the names Castor and Pollux were suggested. The names seem to fit the project, and soon the port engine was known as Castor and Pollux became the starboard twin. 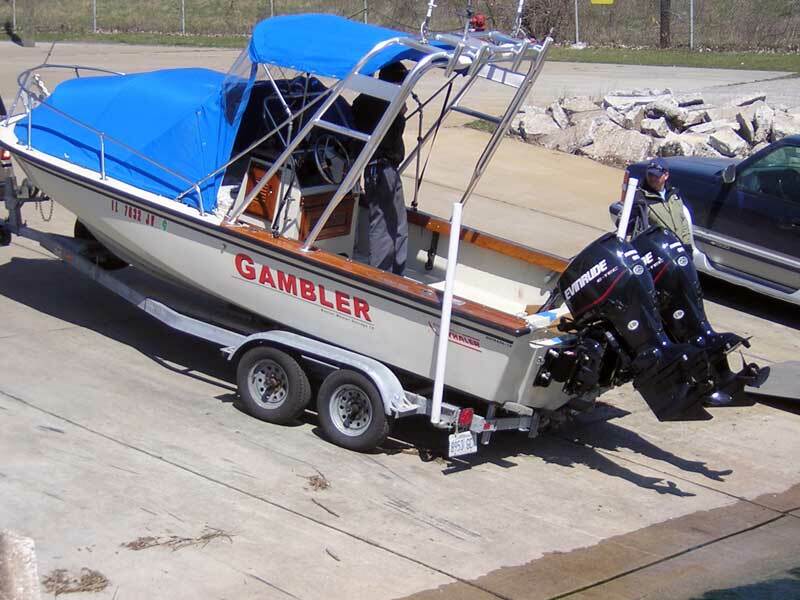 Dave spent many cold winter weekends re-fitting GAMBLER. As part of the project, a new deck was fabricated to replace the original cockpit deck cover. Instead of a fiberglass laminated structure, Dave built a wooden deck using plywood and teak. Besides adding a classy appearance to the cockpit, the new deck was lighter, saving weight which would help with the twin engine re-fit. In early April, the boat was ready for a sea trial with the new engines. 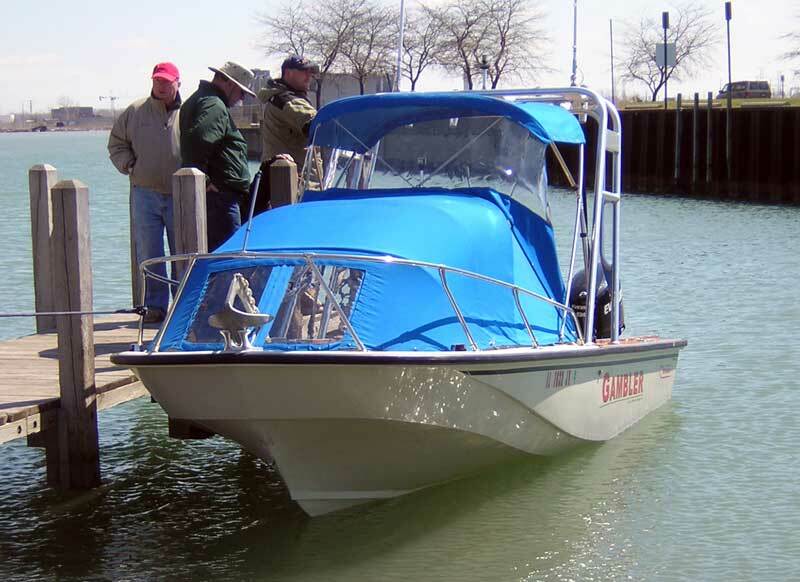 However, before the engines were started, the boat was returned to Lockeman's for inspection. Certified E-TEC mechanic Douglas Zammitt prepared the engines and performed the initial engine start-up. From there, a short haul to the launching ramp would permit propeller testing. This is where our visual story begins. The first step in the conversion was to rework the transom for twin engine from the original single engine configuration. The old engine was removed, along with a poling platform. The engine mounting holes in the transom were filled with plugs, sealed with epoxy, and top coated with new matching resin. New mounting holes for the twins engines were drilled using a manufacturer's engine drilling template. Rite-Hite 10-inch set back brackets with jack plate adjustments were installed; the pre-drilled holes on the bracket aligned perfectly with the transom and the motor. The bracket is aluminum which has been painted black. Odd lighting conditions make the motor's color appear lighter than its usual deep blue, exaggerating the color contrast between engine and bracket. The sacrificial anode cap nuts were intended for the lower mounting bolts, but due to the design of the bracket they would not fit. Dave plans to relocate them. 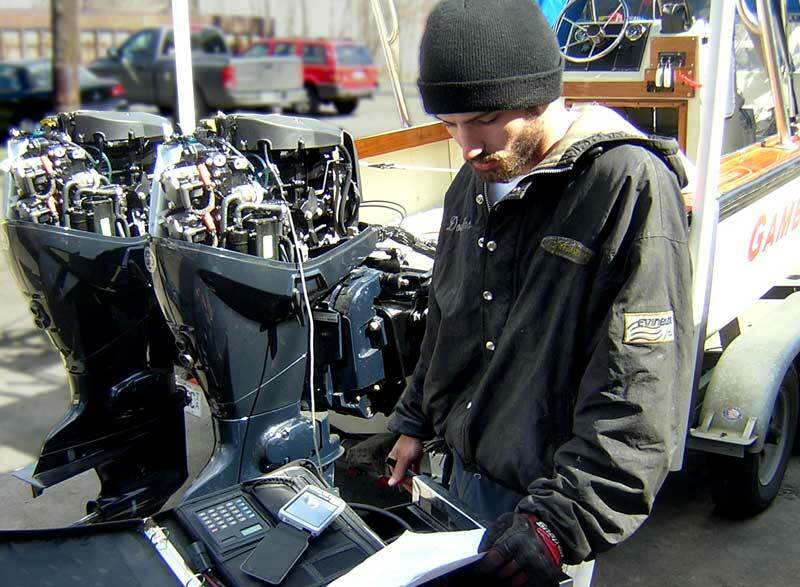 With twin engines on a small boat, special attention has to be paid to the rigging. There are twice as many fuel lines, electrical harnesses, and shift/throttle cables to be handled. Dave has done a very neat job with the rigging. The fuel primers are nicely located near the engines and with their orientation near vertical. The shift/throttle cables make a 270-degree bend. 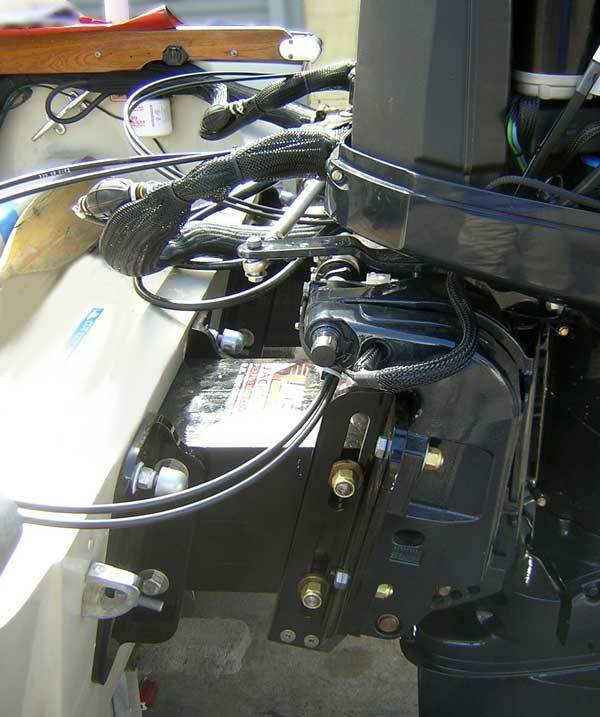 The harness to the port engine runs across the tilt tube area of the starboard engine, avoiding interference with the center mounted hydraulic steering actuator. The drag link to the port engine was relocated after this picture was taken. Notice the excellent color match between the painted metal components of the E-TEC, like the mounting bracket, and the plastic molded portions, like the mid-section shroud. Despite their different material, finish, and reflectivity, the color match is just about perfect. The steering on GAMBER was upgraded to a TeleFlex hydraulic center mounted steering actuator. This gives a balanced steering, i.e., same number of turns lock-to-lock in either direction. Another winter project was installing a replacement deck. Instead of a molded deck with non-skid, Dave fabricated a beautiful teak deck. 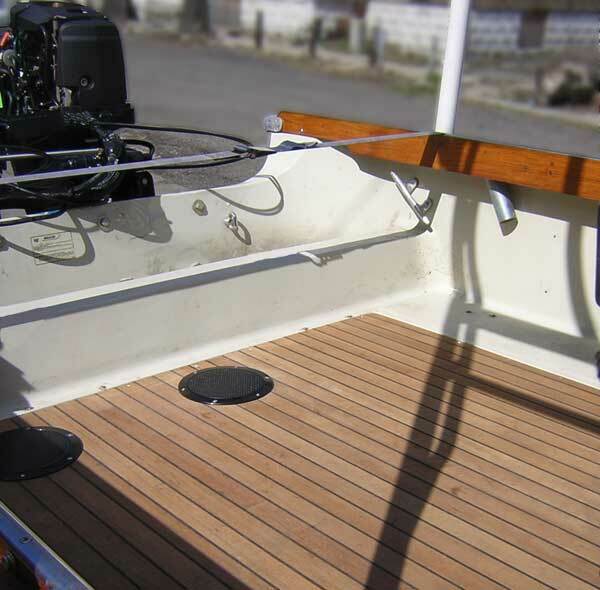 WEST System epoxy was used to laminate the teak decking to marine plywood. The original 52 holes in the hull were filled with sealant, and new mounting holes were drilled to fasten the new deck to the hull. After mounting and rigging the engines, Dave brought the boat back to Lockeman's for a careful inspection and check out. Douglas Zammit made a number of tweaks to the set-up, then loaded the latest firmware into the motor's Engine Management Module. By about 2 p.m. on a cold Saturday in April, the engines were ready for their initial start-up. Starting was a bit anti-climatic: Castor came to life in less than two revolutions of the crankshaft. Pollux was troubled with a battery that was a bit weak, and took three revolutions to fire up. By afternoon the sun was trying to warm up the day. Dave backs GAMBLER down a steep ramp at the Delray boat launch, a block away from Lockeman's. Douglas rides the boat into the water. I was thinking, "I hope that winch rachet holds!" 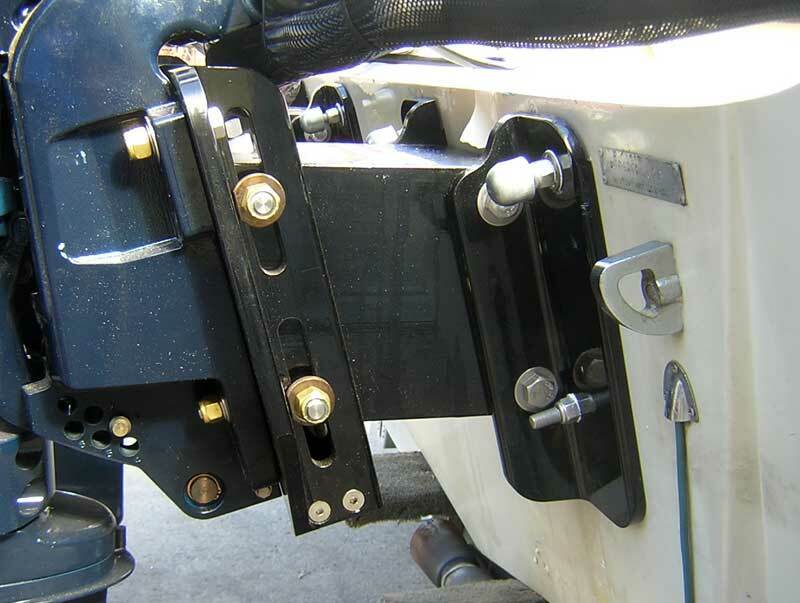 The 12-inch set back brackets with jack plates hold the 90-HP E-TEC in position. The first question to be answered when the boat hit the water: what effect will the new engines have on the boat's static trim. The twin engines and twin set back brackets and jack plates added weight to the boat at the transom. Everyone was quite pleased with results. We put three large adults aboard and leaned over the motors; a couple of inches of freeboard still remained on the notched transom. The launch was well attended: Pat, Don, and Jeff look on. This view shows resting trim seen in more profile. Douglas has the cowling off Pollux to check for an electrical problem. We soon had that diagnosed: bad battery extension cable connection in the rigging tunnel. 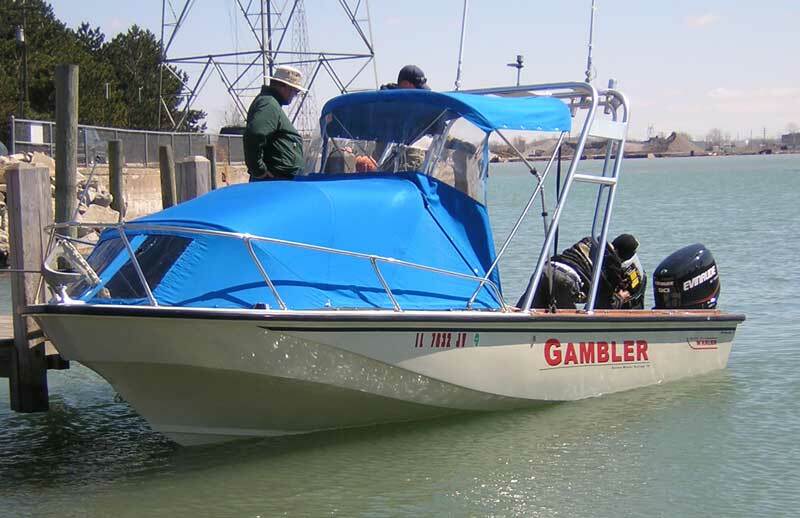 A quick repair was made, and GAMBLER was ready for the sea. With owner Dave, master mechanic Douglas, and photographer Jeff aboard, GAMBLER made her way down the Delray boat launch canal and into the Detroit River. Wind and wave conditions were excellent for testing. The river had a slight chop and about 10-MPH cross winds. The cold weather kept all but the most diehard fisherman off the river, which was thus transformed into a big test pond. The proportions of the boat and motor are very pleasing. The compact 90-HP E-TEC is a good size for this application. The aesthetics are wonderful. In a few seconds more, we will discover the performance. The boat performed as anticipated: very quick to plane and a top speed in the 50-MPH range. The hull runs with just a few feet of the keel in the water, and the wake it makes is correspondingly small. In this picture, we are making about 35-MPH. 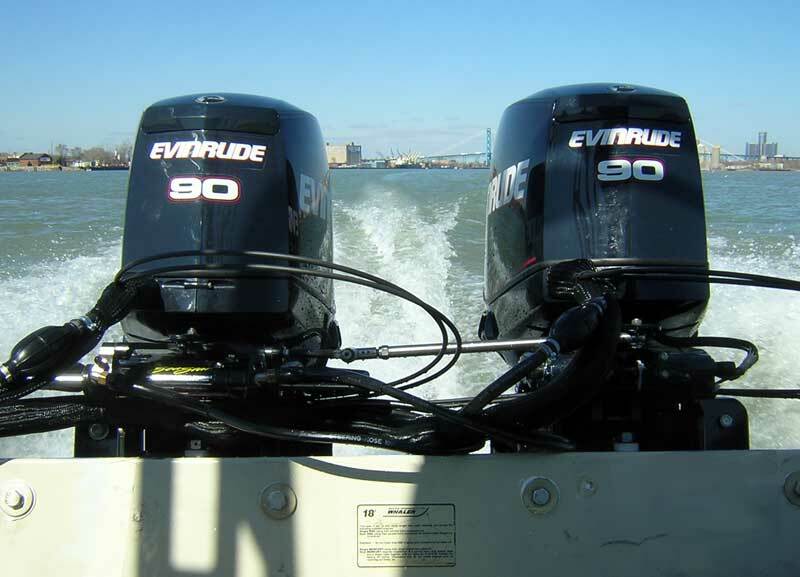 The two new Evinrude motors seemed to sing on the transom. The E-TEC exhaust note tuning is quite distinctive and pleasant to the ear of motor enthusiasts. Dave's excellent rigging of the control cables put them into a 270-degree loop. Castor is lifted about an inch higher than Pollux in this test run. 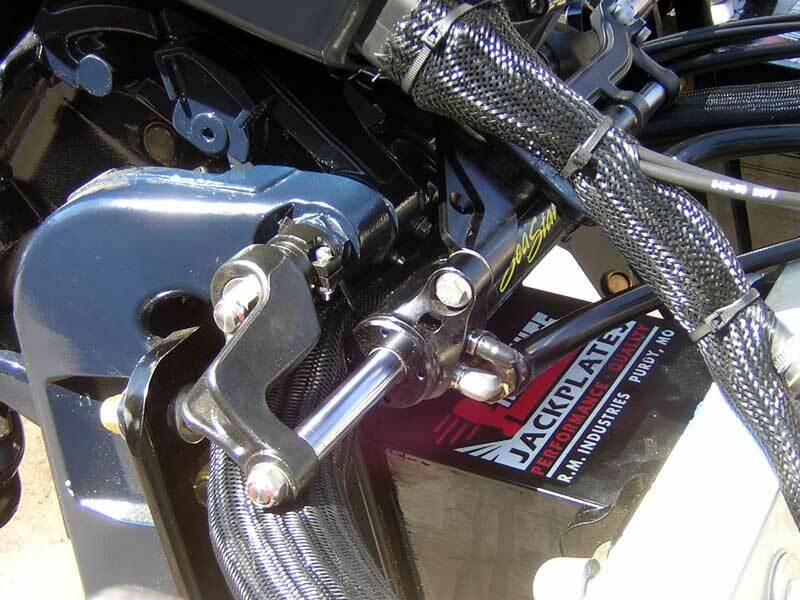 Engine height can be easily adjusted with the jack plates. On this run, the anti-ventilation plate is running just at or slightly below the water surface. The trailing edge is noted by the arrow and callout in the photograph. This view also shows the excellent TeleFlex steering hardware. The tie bar has a hinge, as well as socket-and-ball joints on either end. This allows either engine to be tilted up without binding the tie bar link. The spray deflector is doing its job, knocking down spray coming off the leading edgle of the gear case. This close up shows the water rising as it comes out from under the hull transom. It appears there may be room to raise the engine some more. 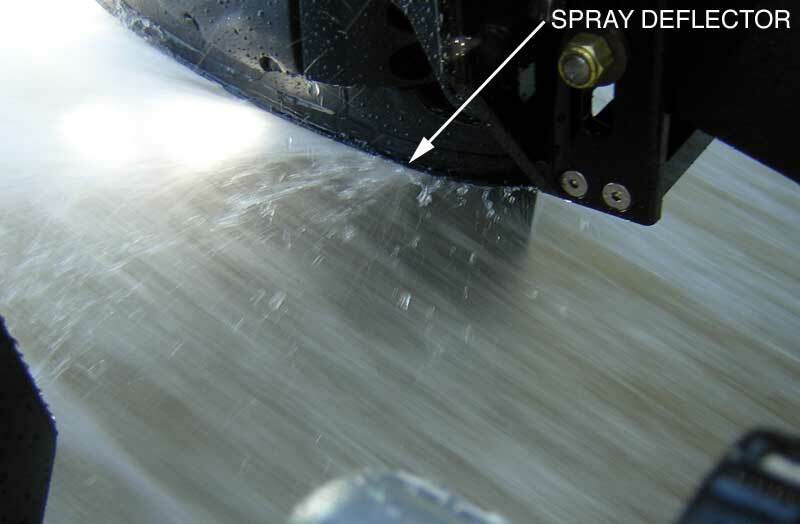 On the 20-inch shaft engines, the single spray deflector is located about 2-inches above the anti-ventilation plate. 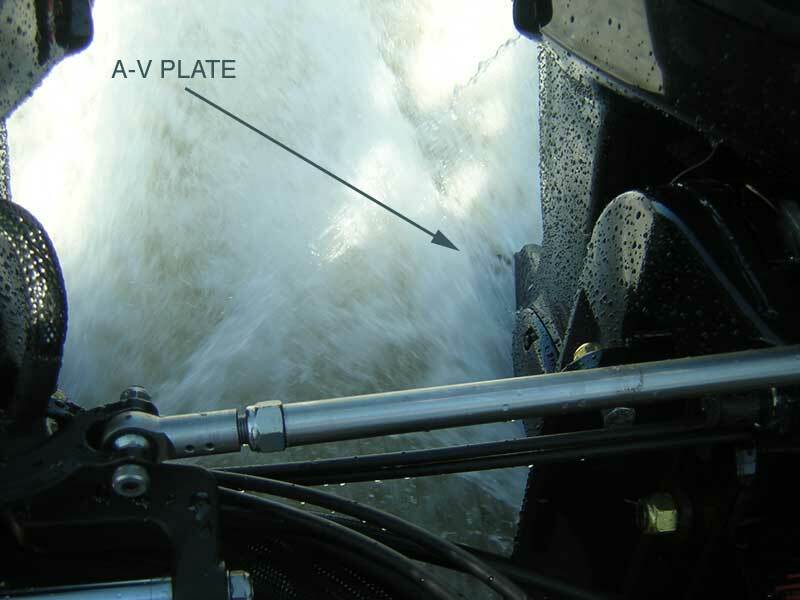 This provides a basis to assess where the A-V plate is running, and again, it looks like it is just at or below the waterline. GAMBLER, Castor, Pollux, David Zammitt, and Dave Buckalew pose for a family portrait. Testing stopped after four runs. Fuel was down to a couple of gallons. The results were very good. Jeff was aboard for the initial run up of boat on plane and recorded this video. You can hear for yourself the distinctive sound of the E-TEC direct-injection two-stroke engine, as well as the reaction of Dave to his new motors. The unique design of the E-TEC engine permits high-speed operation following initial start-up. No extended break-in period is needed. The Engine Manangement Module provides additional lubrication during the first ten hours or more of operation, and use of special alloys and honing in the power head eliminate the need for the normal "wear-in" prior to full-throttle operation. Dave plans more testing and adjustment of the engines. More performance data will be available in a future update. The page has been accessed 47544 times. Copyright © 2003 by James W. Hebert. Unauthorized reproduction prohibited! This article first appeared April 16, 2006.